Colleen is a whisker away from becoming valedictorian at St Joan's Academy in Danvers, but the competition is pretty intense. That is, until her classmates start exhibiting strange medical symptoms (tics, hair loss, coughing up pins, etc.). Panic grips the school as a variety of increasingly implausible explanations are floated for what is happening. The reality, however, is that no one is really sure. More and more girls start to fall ill to the symptoms and a media circus develops. 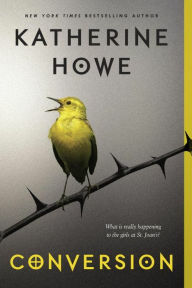 Told in parallel with the story of the Salem Witch Trials, Howe attempts to provide an explanation for both the current events and that historical moment of mass hysteria. An interesting premise where Howe, inspired by a real-life outbreak of mysterious symptoms at a private school in 2012, combined that story with her knowledge of Salem's unfortunate events, to create a novel about the intense emotional pressures that girls face around graduation. I found that to be a clever concept and the storytelling to be exquisite. I'm less of a fan of the actual story, but that is because the subject matter has always seemed distasteful to me. The combination of egocentricity, prejudice, and sheer spiritual vacuum that is exhibited at Salem holds about as much appeal as a slasher movie for me. But the story works and I certainly finished the book.